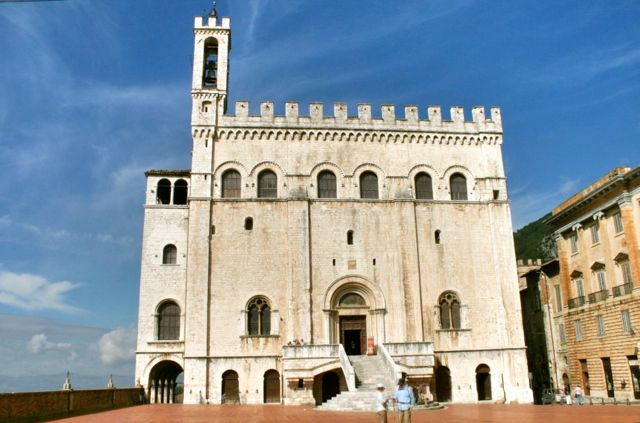 The Madonna della Cima walk takes 4-5 hours and is in the hills behind the Umbrian town of Gubbio. The walk starts and ends in the centre of Gubbio. After walking through the medieval town centre you use the funivia to get to the Basilica di Sant’Ubaldo, a church near the top of Monte Ingino where the body of the town’s patron saint is kept in a glass coffin. The funivia is a cross between a ski lift and a cable car – you have to scramble in and out of a moving metal cage. This may seem like cheating, but you have a long walk ahead of you and by the end of the walk I guarantee you’ll be pleased that you didn’t climb up. Right at the top of Monte Ingino is an old watch tower with marvelous views and you can also see much of the route from up here. The route follows tracks and narrow paths and, as you cross the road between Gubbio and Scheggia you pass the Madonna della Cima, a small shrine marking the highest point on the road. You can find instructions for this route in my e-book, Circular Walks on the Tuscany Umbria Border by Martin Daykin on the Amazon website.